After you sell your house, you may need to move quickly to pack up your belongings and relocate to a new address. If you know how to host a successful garage sale, you should have no trouble de-cluttering your home and earning extra cash at the same time. A garage sale represents a valuable opportunity, as it will enable you to get rid of excess items before your upcoming move. Plus, a garage sale allows you to go through your personal belongings and separate the must-keep items from non-essential ones. 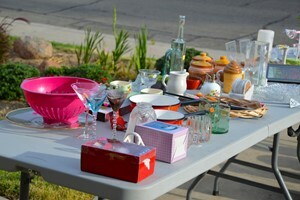 So what does it take to host a successful garage sale? Here are three tips to ensure you can do just that. When would you like to host your garage sale? Will you require permits? And what supplies will you need? These are just some of the questions that you should consider as you plan ahead for the big day. Making a list of to-do items may help you stay organized as you prep for your garage sale. Also, as you accomplish each task on your list, you can move one step closer to ensuring your event will be a major success. Creating bright, vibrant posters and hanging them up around your neighborhood is a great way to advertise your garage sale to neighbors and friends. Don&apos;t forget to encourage your friends and neighbors to spread the word about your garage sale as well. Furthermore, social networks allow you to share details about your garage sale with a large group of individuals instantly. They even make it simple to share photos of items that you plan to sell during your garage sale, and as such, may help you generate plenty of interest in your event. As the date of your garage sale approaches, you&apos;ll want to consider how you&apos;ll organize your items. By doing so, you can arrange similar items together and ensure visitors will have no trouble evaluating everything you have to offer. Placing similar items in laundry baskets or bins the night before your garage sale may help you streamline the process of setting up for your event the next day. In addition, be sure to set aside ample driveway or front lawn space for all of your garage sale items. Unfortunately, garage sales sometimes can be unpredictable. And despite your best efforts, there are no guarantees that your garage sale will go according to plan. Stay flexible, and you should have no trouble maximizing the value of your garage sale. For example, if someone wants to negotiate the price of a particular item, listen to what this individual has to say. Because even though you may wind up receiving less than you originally anticipated, you&apos;ll be able to get rid of this item before you move. Maintaining a customer-first approach can make a world of difference throughout a garage sale too. And if you greet visitors when they arrive and chat with them during the event, you may be able to boost your chances of transforming your ordinary garage sale into a successful one. The data relating to real estate for sale on this website appears in part through the BRIGHT Internet Data Exchange program, a voluntary cooperative exchange of property listing data between licensed real estate brokerage firms in which RE/MAX 100 participates, and is provided by BRIGHT through a licensing agreement. Information Deemed Reliable But Not Guaranteed. The information provided by this website is for the personal, non-commercial use of consumers and may not be used for any purpose other than to identify prospective properties consumers may be interested in purchasing. Copyright© 2019, BRIGHT, All Rights Reserved. Information last updated as of 04/24/2019 04:03 AM.